Amsterdam, Netherlands — The umbilical cord is more than a prenatal lifeline: it's also the unborn child's link to the toxic burden of our planet. According to new research by Greenpeace and WWF UK, the toxic chemicals in our cell phones, our computers, our perfumes, our shaving cream, and our clothes are also present in our children. Analysis of maternal and umbilical cord blood provided by volunteers in the Netherlands, published in a study entitled A Present for Life, reveals that known or suspected hazardous substances, present in everyday household products, are entering babies' bodies through the umbilical cord. The chemicals include some which are known to affect physical and mental development in animals. This report, commissioned jointly by Greenpeace Netherlands and WWF-UK, investigated the presence of hazardous chemicals in maternal and cord blood samples. 42 maternal blood serum and 27 cord blood serum samples were taken at the University Hospital Groningen. Independent laboratory TNO-MEP analysed the samples for the following chemicals: brominated flame retardant TBBP-A, phthalates, artificial musks, bisphenol-A, alkylphenols, organochlorine pesticides (DDT), triclosan and perfluorinated compounds. Toxic chemicals found in consumer products are increasingly found in childrens bodies. Toxic chemicals found in consumer products are increasingly found in childrens bodies. The chemicals in question are contained in countless items ranging from food tins and electrical goods to pesticides, deodorants and toothpastes. They include artificial musks, used to add scent to perfumes and perfumed products, and perfluorinated compounds, used in water-repellent coatings and to prepare non-stick surfaces such as teflon. Also found were flame-retardants suspected of causing learning and behavioural problems in animals, and the antibacterial agent triclosan, used in antibacterial soap. The results clearly show the presence of these chemicals in the blood serum samples from both mother and child. Particularly worrying are the hormone-disrupting chemicals, which may cause most damage during the vulnerable stages of development, that is during periods of rapid cell division, such as in early life and particularly when in the womb. A small disturbance in early development can have serious consequences in later life. PCBs and dioxins have already illustrated the potential for long-term, irreversible consequences of exposure to hazardous chemicals. The chemical industry has undergone spectacular growth in the last century. There are now more than 100,000 different chemicals available on the market. Chemicals are incorporated into countless consumer products, some of which undoubtedly benefit our standard of living. But they also provide a source of daily exposure to a cocktail of hazardous chemicals. Hazardous chemicals can be found everywhere. They are released into the environment at several points in their life cycle and travel in the air and in water to even remote areas like the Alps and the Arctic. Some of the most hazardous chemicals do not break down easily and can accumulate throughout the food chain. Food has long been thought to be the primary route of exposure for most persistent and bioaccumulative chemicals. However, in recent years greater attention has been given to the potential exposure directly through the use of products containing hazardous ingredients and indirectly through their contamination of the indoor environment. Greenpeace has analysed a range of everyday consumer products for the presence of a number of (potentially) hazardous chemicals and looked for these same chemicals in house dust and rainwater. The results add weight to the suspicion that these chemicals can 'leak' from products. Follow-up investigations by Greenpeace Netherlands and others have sought to research the extent to which these chemicals actually end up in our bodies, by collecting and analysing blood samples from human volunteers. The results of recent blood research projects by Greenpeace and WWF confirm that we all have hazardous chemicals in our blood, including chemicals that are contained in normal consumer products. Of particular concern is the impact of exposure to these substances on (unborn) children. 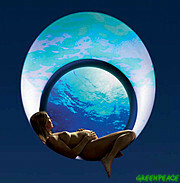 The unprotected foetus is extremely vulnerable to hazardous chemicals. Mothers can unwittingly pass on these substances to their child during pregnancy and through breast feeding (which should not deter mothers from breast feeding, as the benefits of breast feeding are still widely acknowledged). Phthalates, one of the most omnipresent groups of chemicals and used mainly as softeners in Polyvinyl chloride (PVC), as well as in cosmetics and perfumes, were found in many of the maternal and cord blood samples. DEHP, the most commonly used plasticizer, was detected in 29 maternal and 24 cord blood samples. Some phthalates can be particularly damaging to the male reproductive tract, and are toxic to reproduction. Some companies such as the cleaning products manufacturer, Ecover, avoid persistent and bioaccumulative chemicals as part of their core business. Unfortunately not all companies want to shut the door on substances that can contaminate our bodies. Greenpeace testing, for example, found that some Disney children's pyjamas carried toxic-laden PVC prints, and the company has not stopped. That's why we need laws -- voluntary compliance simply isn't good enough. PVC toy purses containing heavy metals. PVC toy purses containing heavy metals. How then can we better protect our children from exposure to such potentially harmful chemicals? The only answer is for governments to put in place mechanisms that will drive industry to replace these chemicals with safer alternatives. Proposed new EU legislation on chemicals, 'REACH' (Registration, Evaluation and Authorisation of Chemicals), gives Europe a crucial opportunity to take the necessary action to protect humans and the environment from the effects of harmful chemicals and to make producers responsible for the impacts of their products. REACH is intended to protect people and environment. But a powerful industry lobby threatens to weaken this legislation. Greenpeace and WWF are calling on legislators to put the interests of public health and the environment first, by ensuring that the worst chemicals are identified and phased out, and by making it obligatory to substitute toxic chemicals with safer alternatives. An obligation to phase out the production and use of chemicals that accumulate in wildlife, humans or the environment, and those that disrupt hormones. An obligation to substitute hazardous chemicals with safer alternatives. Complete disclosure of substances used in manufacturing processes and the composition of products, including the effects and properties of chemicals. Make industry accountable for the impacts of their products. Make importers meet the same standards as manufacturers in the EU. In the next few months European politicians will decide whether or not to protect the people and environment or to allow industry to continue contaminating our bodies. Help us close the door on toxic chemical contamination. Help us carry on the work of exposing dangerous chemicals and challenging the industries that don't want them regulated.